I recently asked Who is pushing the classical envelope? My header photo shows a little-known figure who certainly pushed the classical music envelope and in the process created a new sound world that is ripe for rediscovery. Claude Vivier, was born to unknown parents in Montreal in 1948. After adoption his education prepare him for the priesthood until he was expelled from his seminary for "immature behaviour". But his religious training had awakened another vocation and he went on to study music, first in Montreal and then in Europe where his teachers included Karlheinz Stockhausen. In 1976 Vivier visited Japan, Bali and other Eastern countries and their musical traditions influenced his composing style. He wrote his first opera Kopernikus, which he described as "a ritual opera of death" in Canada in 1980. After this he came under the influence of the French spectralist composers whose computer techniques have been developed more recently by Jonathan Harvey. 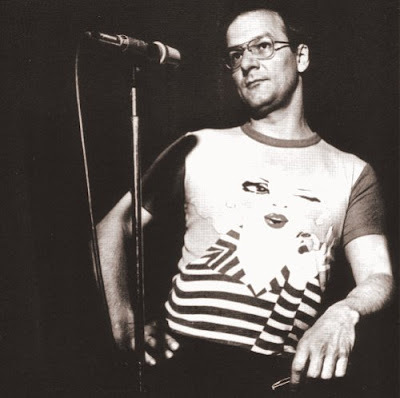 In 1982 Claude Vivier moved to Paris. The biography on his publisher's website says "Vivier was open about his homosexuality" and on the night of March 12 1983 he was murdered by a male prostitute he had met in a bar earlier that evening. His last work, the unfinished Glaubst du an die Unsterblichkeit der Seele for voices, narrator, two synthesizers, three percussionists and electronics, is notorious for containing a prophecy of his death. Although Vivier's music is influenced by the French spectralists it is a mistake to categorise him into a particular stylistic school. His composing style is unique and identifying him with the esoteric and electronic world of the spectralists may be one explanation for the puzzling neglect of his music. The introductory quote from Paul Griffiths is very revealing. Paul writes that Vivier "began to bring back... a new sound". At first "to bring back" something "new" sounds contradictory. But it is a perfect description of Vivier's special sound world which explores the edge of experience while still sounding disconcertingly familiar. 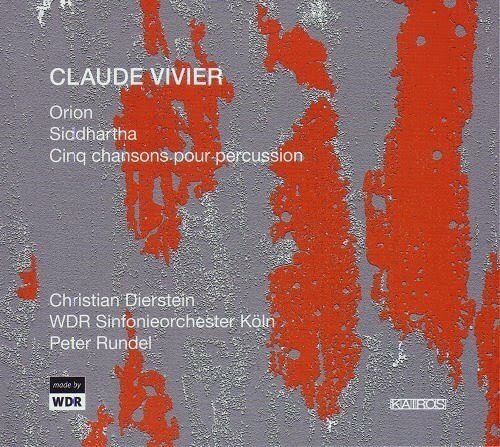 The CD seen below provides an excellent introduction to Claude Vivier's music. It is recorded by the Radio Symphony Orchestra of the WDR (West German Radio) conducted by Peter Rundel and percussionist Christian Dierstein for the Kairos label* and captures three of Vivier's later non-electronic compositions. It is a measure of the neglect of his music that these are the first recordings of two of the works. Orion from 1979 is the only work by Vivier to have been performed at the BBC Proms, it was given its UK premiere during last season by the Royal Philharmonic Orchestra conducted by Charles Dutoit. It is also the first of Vivier's works to use the layered overtones associated with the spectralist school. The second work by Claude Vivier on the disc is Siddhartha for orchestra in eight groups. This is inspired by Hermann Hesse's Buddhist novella of the same title and hints at other Teutonic influences in its German title Siddhartha, für Orchester in acht Gruppen. Composed in 1976 to a Canadian Broadcasting Corporation commission, Siddhartha is considered by some to be Vivier's finest composition. Which makes its virtual absence from the performed repertoire and CD catalogue a complete mystery. The third work on the CD, Cinq chansons pour percussion, is exactly what the title says, five orchestral 'songs' (in the Asian meaning of the word) for percussion. This late work should be in the repertoire alongside the 20th century percussion masterpieces of Steve Reich, Edgard Varèse, John Cage, Karlheinz Stockhausen, Carlos Chavez and Lou Harrison. In a nicely considered response to my post on pushing the classical music envelope Antoine Leboyer reminded us the priority was 'art not enjoyment'. Claude Vivier lived his all too brief life to the full. But he did not seek approval, and that is the drug that is today sapping the life force out of classical music. Instead he applied his energies to creating a new sound while staying true to his art. For tangible evidence look no further than the excellent Kairos CD from Peter Rundel, Christian Dierstein and the Radio Symphony Orchestra of the WDR. 'The only people for me are the mad ones, the ones who are mad to live, mad to talk, mad to be saved, desirous of everything at the same time, the ones who never yawn or say a commonplace thing, but burn, burn, burn, like fabulous yellow roman candles exploding like spiders across the stars and in the middle you see the blue centerlight pop and everybody goes "Awww!' - Jack Kerouac 'On the road'. * The innovative and independent Kairos label also brought us Kurtág's Ghosts. Thanks for this post on Vivier! More than a decade ago I picked up the compilation of his works "Lonely Child / Prologue Pour Un Marco Polo / Zipangu / Bouchara" on the Phillips label conducted by Reinbert De Leeuw. It's a fantastic recording and I still listen to it regularly. Highly recommended. Anyone wishing to read the full version of Paul Griffiths' excellent piece on Vivier may find it in his book, Substance of Things Heard, published by the University of Rochester Press. I only picked up on this thread on your blog almost 2 years late. I have the CD featured but don't find it as representative of Vivier's work as the DVD set from Opus Arte titled Reves d'un Marco Polo, which includes full performances of Lonely Child / Prologue Pour Un Marco Polo / Zipangu, as well as Shiraz, etc. And all directed by Reinert De Leeuw. This set really is - as the BBC R3 crew would put it- a 'total immersion' experience.